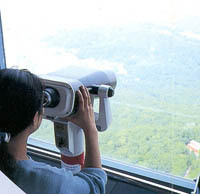 Seoul Tower is one of the must see places to visit in Seoul. It is located on top of Mt. Namsan, and it's 237m tall. If you buy a ticket at the tower you can also visit other places such as the underground aquarium. It's quite a view from the tower overlooking Seoul especially at night. When the weather is good you can see as far as Inch'on. Furthermore, you can have a pleasant time dining at the revolving restaurant with a spectacular view of the city. Taking the cable car to come down from the tower will be a wonderful experience. 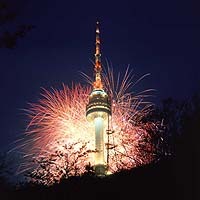 If you have extra time, visit Palgakjeong and Bongsudae located close to the tower. Bongsudae used to be a place to warn people of invading enemies using smoke signals. A special event is held on January 1st every year and gives you an opportunity to see traditional Korean games such as kite flying.